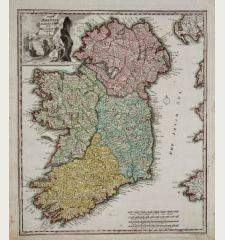 Rare and incredible decorative map of Ireland with beautiful old colour. 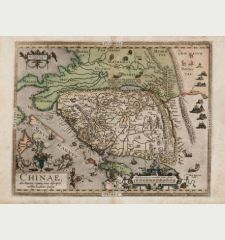 This west-oriented map rarely appears on the market, since it was bound in only a few copies of the Ortelius Atlas, while the publication was done by J. 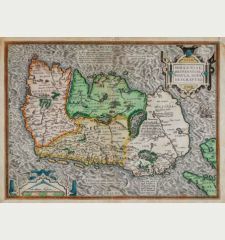 B. Vrients. 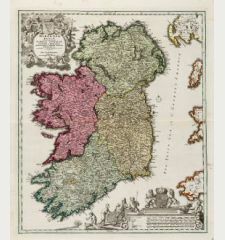 The map is a derivative of the large Baptista Boazio Ireland map engraved by Elstrach and published by Sudbury in 1599 of which only three examples survived. 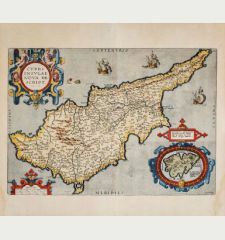 It comes from an Italian Ortelius atlas of 1608 or 1612. 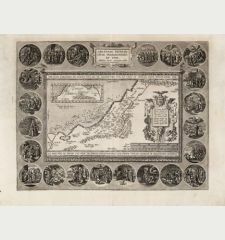 Secound state of the rare new plate with dedication to St. Patrick in the upper right cartouche. 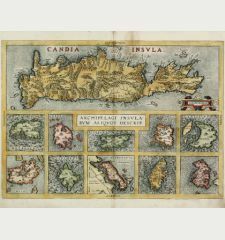 One of the most desirable map of the island for collectors. 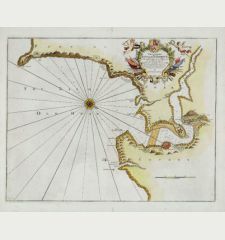 Decorated with six cartouches and exceptionally well-engraved ships and sea monsters. 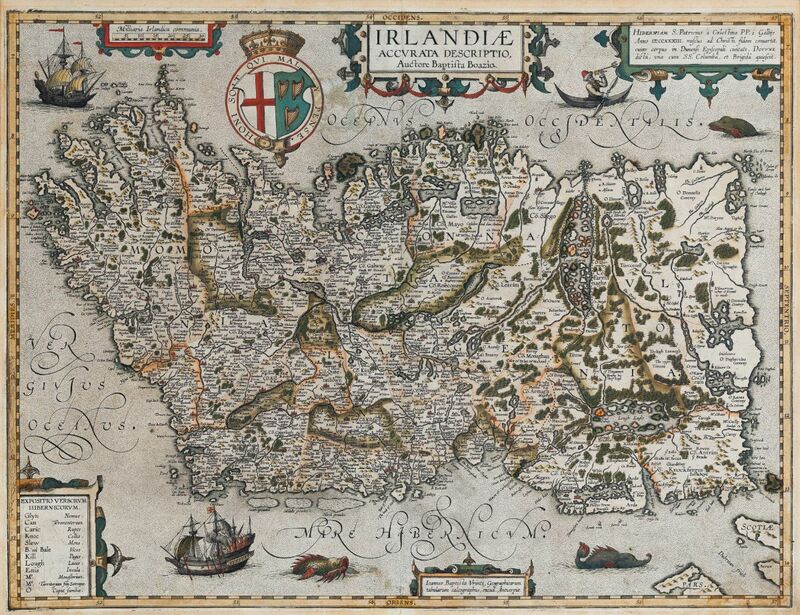 With a large coat of arms cartouches showing the British coat of arms with the St George Cross and the Irish harp. 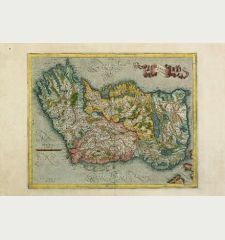 Italian text on verso with a large old coloured initial. 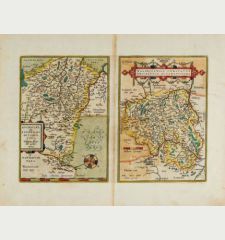 Reference Van den Broecke, M.: Ortelius Atlas Maps, No. 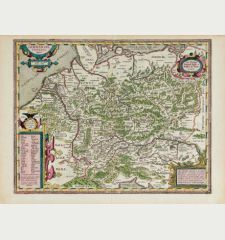 23; Van der Krogt, P.: Koeman's Atlantes Neerlandici, 5900:31B.2. 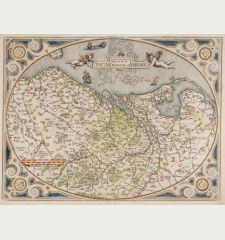 Since the map is very large for an Ortelius atlas, it often has defects up into the image or has been cropped. 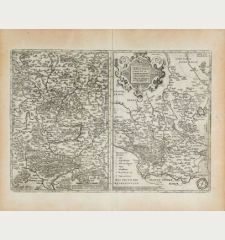 The copy offered here has an excellent preservation with full original margin on all sides, only a small tear in the lower margin and in the lower centrefold have been backed, some minor toning. 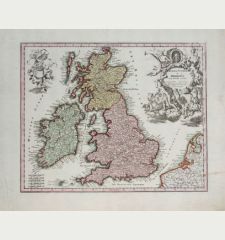 Along with the original old colouring, this example is in very good condition. 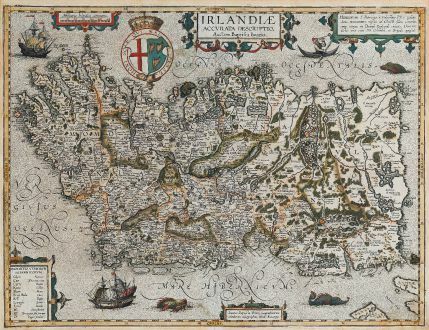 Abraham Ortelius: Irlandiae Accurata Descriptio, Auctore Baptista Boazio.